My gardening style is what I like to call, Contained Chaos. I like the look of wildflowers growing in nature, but I also like neatly arranged plants, like using boxwood as a border, or rows of plants like grown in a farm field or orchard. 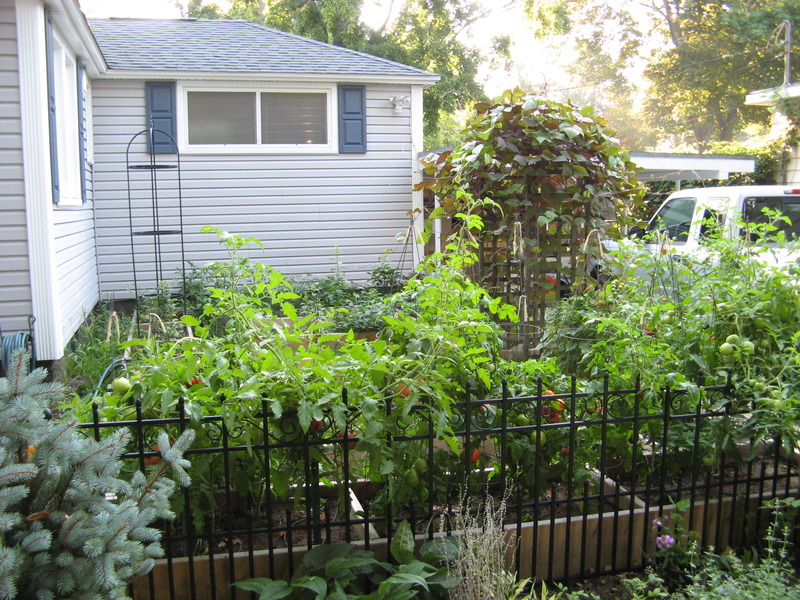 I think that’s why when I designed the culinary garden at My Urban Farmscape, I wanted my veggies to be planted in raised beds. Each raised bed is laid out in neatly arranged patterns providing several individual sections to grow my veggies, fruits and herbs. But that doesn’t mean that when the plants start growing outside of thier boundaries I want to hold them back. They are allowed to wander and intermingle as much as they like. It’s like, I try to control them, but then I give up because I know they will grow where they want. Plants have a mind of their own right, or maybe, the instinct and desire to follow the sun. 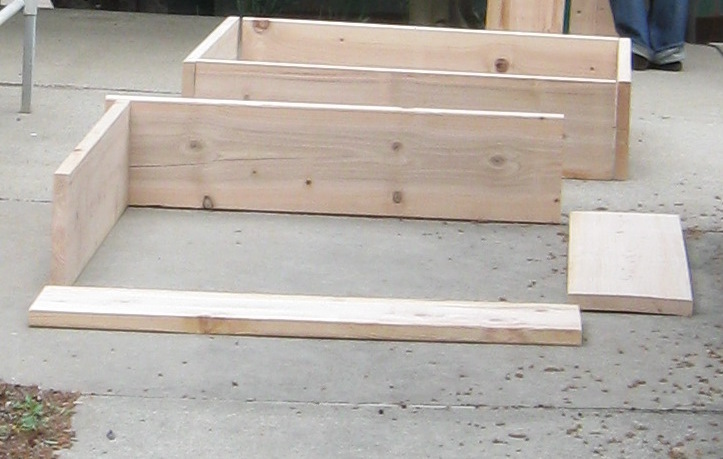 When I decided to make my raised beds, I researched the options and chose to make them with 2” x 12” pine lumber. 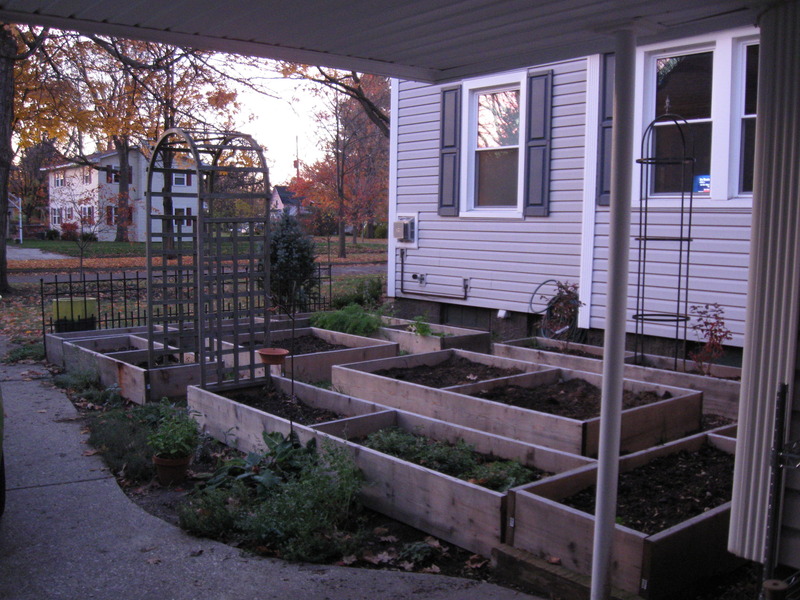 DO NOT use treated lumber of any kind for growing anything edible. I looked into options for preserving the wood, but then realized that the wood I chose will last a very long time, and by the time it was rotted, I would have gotten my money’s worth just using the plain pine and it wasn’t worth the added expense. So, here is what I did. This is the space between my house and the driveway. It is the sunniest space in the yard, which is what I needed for the culinary garden. So…..out with the old and in with the new! I didn’t remove the lawn though. No need, since 10” of soil would be on top of it, it won’t grow any more. I did have to transplant the shrubs and cut down an ornamental tree. The 2” x 12” boards were cut to the desired lengths. If you don’t have a saw, you can ask your lumber store to cut them to the lengths you want. They will typically do this at no charge. It is easy to ask them to cut a 2” x 12” by 8’ board in half. Do this for two boards and you will end up with a 4’ x 4’ garden. I chose to use 3” deck screws to screw them together. There are fancy type corners you can get, but it was getting a little too expensive for my garden. Some of my beds are 2’ x 8’ or longer, so I added a board in the center for additional strength and/or to keep it from bowing. Once the boxes were made, they were place directly on the ground. I filled them about 3/4 full with topsoil. If you don’t have access to free topsoil, then try to purchase it by the yard. It is cheaper. Otherwise, you will have to buy it by the bag. A 4’ x 4’ box takes about 1/3 yard of topsoil to start. I then mixed in compost to the remaining portion, ending a couple inches from the top. My cost for a 4’ x 4’ garden last summer was about $25.00 each. That is the wood and the topsoil and compost. You can make these any size you like, and they will fit in most every Urban Farmscape. These will last for years. If the ends start to come apart or the boards warp, I will make small adjustments as they come. I just found this method to be the most practical and affordable. The first year I was able to harvest a bushel of tomatoes from a 2’ x 12’ raised bed. I spaced the tomatoes diagonally about 2’ apart. So in a 2’ x 4’ space I was able to plant 3 tomato plants. They were indeterminate types which I pruned and staked them. I will talk about that more when I write about tomatoes. I also planted blueberries, corn, cucumbers, carrots, peppers, squash, beans, garlic, parsley, oregano, basil, sage, thyme, and several edible flowers. 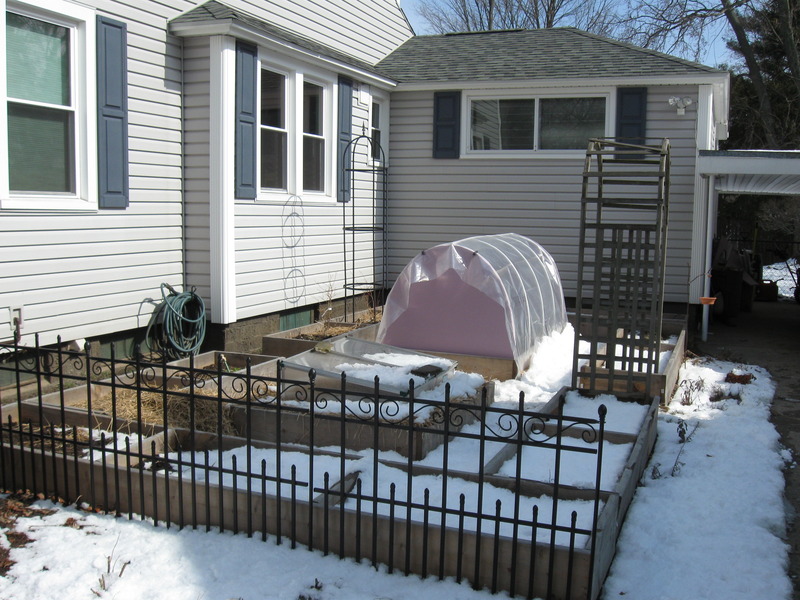 I planned space for cold frames also. I overwintered carrots under straw (see poem on Winter Carrots). This will be the second season for the culinary garden at My Urban Farmscape. The warm weather we have been experiencing has made it EASY to clean up and prep my gardens, but the only thing I am planting are my cool season crops such as spinach, arugula, lettuce, carrots, beets, and radishes to name a few. And that is still in my cold frame (open ends and tops off for now). Don’t be fooled by Mother Nature! Our frost free date is about May 15th, still a long ways away. For now, continue planning and if you like your garden chaos contained like I do, start building your raised beds! Before you know it, it will be time to plant for the summer! very nice garden … I like the raised beds, looks very neat. Thanks! They really help in such a small space. I love your September garden photo. What a beautiful garden. How much sunlight does that area get? This garden faces south so it gets full sun all day from about 9am to 7pm. The other times it is shaded by neighboring house or a big Maple.